When Bethany first propped her camera on a stack of books and pressed record in 2009, she didn't realise her life was about to change-forever. 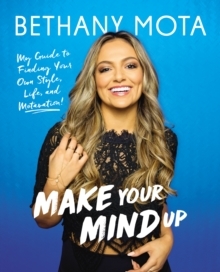 After uploading her first video to YouTube at just thirteen years old, Bethany quickly became one of the Internet's go-to beauty, style, and lifestyle vlogger. Since then, she has filmed countless room tours and tutorials, travelled the world, experimented with hundreds of DIYs, designed her own clothing line, gone on an international tour, competed on Dancing with the Stars, and created health, beauty, and wellness content for multiple platforms. But before Bethany found her #MotaFam online, life wasn't looking so great: After being intensely bullied in school, the already shy Bethany retreated further into her shell, suffering from crippling anxiety and a lack of self-confidence she just couldn't shake. From growing up on a dairy farm in small-town Los Banos, California, to figuring out how to overcome anxiety and find her voice, to finally breaking out of her shell and learning to forge her own positive path, Make Your Mind Up is more than just a heartwarming memoir or lifestyle guide-this is a portrait of Bethany's life, exactly how she lives it.